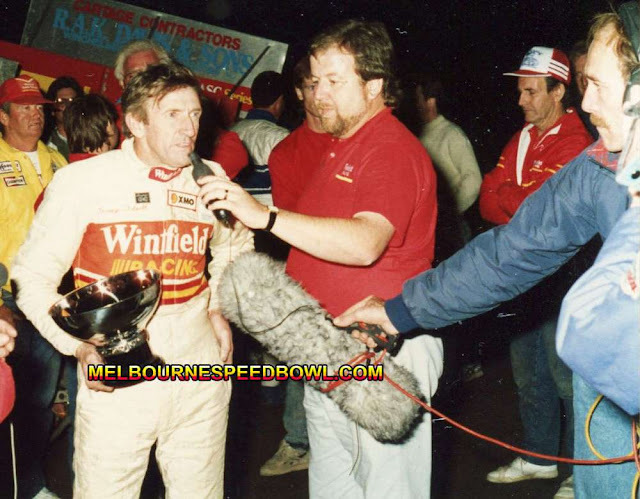 Ian was "The Melbourne Speedbowl's" regular commentator from the early 80's until it's closure. Speedway and was fun to listen to, he was never boring. to leave me loose wheel", he had plenty of them. asked to fill in when the regular commentator was unable to make it. Ian was Nicknamed "Quincy" after his job at the Coroners office. Speedway events and then went on to super speedway at the Calder park Thunderdome. After the demise of Super speedway, Ian went on to manage "Premier Speedway"
for some time, I remember a night, I think it was the "Grand Annual Sprintcar Classic"
of race meetings I've been to that will be the stand out for me. experience was a generous good character missed by many.